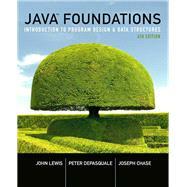 Java Foundations is a comprehensive textbook for introductory programming sequences. The versatile layout supports a two-or three-semester schedule and introduces you to the world of programming—from the basics, to complex data structures. Inspired by the success of their highly successful text, Java Software Solutions, authors Lewis, DePasquale and Chase build a solid framework for lasting comprehension. The Fourth Edition is updated and revised to keep the content fully up-to-speed while incorporating changes from user feedback. One such revision is maintaining a section on Swing in addition to a separate chapter dedicated to JavaFX. Although JavaFX is slated to replace Swing as the main graphics package in Java, the large amount of existing Swing code will continue to make it relevant for some time to come. The overall flow of the text is redesigned for intuitive progression through programming discussions and problem solving.